Maintaining the hygiene of the carpets is important and regular carpet cleaning can ensure that they are clean. Floors can be washed using different methods, but one should choose the right method of cleaning depending on the type of material. If you are new to cleaning techniques used for carpets here, we have discussed few to help you decide on the right type of technique that best suits carpets at your home or facility. A carpet shampoo cleaning method is one of the best methods for carpet cleaning. The method involves using a shampoo application to form a foam which helps to bring the dust particles to the surface. The foam is left to dry, the solution becomes brittle once dry and can be separated from the fiber easily. Once the solution is dried and removed the carpet is vacuum to remove leftovers of the dried foam. Although this method can be carried out individually, professional carpet cleaners carry out the job quickly for you using the latest equipment and branded quality products. This method is the most economical method and can save you on time and efforts. Steaming is another popular method of removing dirt and soil from the carpets. It is also known as hot-water extraction method and is very effective in removing the dry soil that is settled in the deep layers of the fibers. The temperature of the hot water or steam that is used for extraction is usually between 150 degrees to 200 degrees Fahrenheit. The high-temperature hot water is sprayed onto the floor with high pressure to loosen the dirt particles in the layers and then vacuum-sucked to remove the dust particles which leaves the carpet bright and fresh. The hot water can be mixed with recommended mild detergent or cleansing solution for effective results. Steam cleaning not only removes dust and soil from the fibers but also kills disease-causing virus and bacteria apart from dust mites and other germs. The carpet gets washed of allergy-causing pollen and allergens with this method. It is always advisable to hire reputed and professional carpet cleaning services if you are opting steam cleaning method as they exactly know what temperature water suits which type of flooring material. Professional cleaning companies use truck mounted hot water extraction equipment which is efficient in removing dust and dirt. The dry method does not use any water for washing and hence the name dry cleaning. The powder used in this method is an absorptive material that is a mixture of detergent, solvent and minimal quantity of water. The powder is sprinkled on the carpet with the help of a specialized equipment with rotators and is left undisturbed for 15-20 minutes. A high-power vacuum machine is used for extracting the powder from the fibers along with the dirt and dust particles. 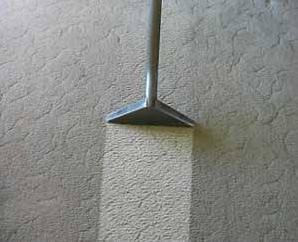 The method is supposed to be very effective and safe for carpet cleaning as it does not wet the material. However, all the methods mentioned above may not be suitable for all types of floors, and hence it is advisable to hire services of professional carpet cleaning companies for efficient and safe treatment.